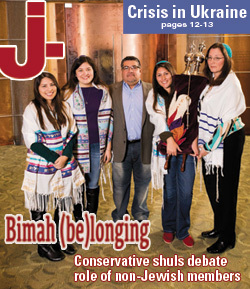 Bimah (be)longing: Conservative shuls debate role of non-Jewish members – J.
Karen Hirsch and Jim Condit looked on proudly as their son Tyler became a bar mitzvah at Congregation Kol Shofar. However, for part of the ceremony, they were looking on from different vantage points. Hirsch stood on the bimah while her husband, who is not Jewish, had to sit in the pews of the Tiburon synagogue. Since then, the Conservative synagogue has evolved, expanding opportunities for non-Jewish spouses and children of interfaith couples to participate. Today Condit would be welcome on the bimah, though he still could not take part in the Torah service. For Hirsch, who has been on Kol Shofar’s board for the last nine years and served as congregational president, interfaith issues hit home. When it comes to ritual, red lines are still being drawn in the Conservative movement. To an outsider, the battles might seem fought over trifles — in some cases, just a few feet. Where may a non-Jewish parent stand during the bar or bat mitzvah? Can a non-Jew open the Holy Ark? Should non-Jewish synagogue members have voting rights? To Conservative synagogues, these questions are not trivial. They cut to the heart of a philosophical and practical debate about how open they should seek to be toward the non-Jews in their midst. And they have been pushed to the fore by the growing number of Conservative households — more than one-fourth — that include non-Jewish family members, according to the Pew Center’s recent national survey. The discussions also come at a time of serious decline for the Conservative movement, whose share of the American Jewish population has fallen to 18 percent, according to the Pew study. Last December, Rabbi Charles Simon, executive director of the N.Y.-based Federation of Jewish Men’s Clubs, organized a meeting of Conservative rabbis at which they opened an old can of worms: intermarriage. Among the many questions they pondered is whether to allow children of a Jewish father and non-Jewish mother to become b’nai mitzvah. These days Helfand and his Conservative colleagues continually wrestle with ways to balance inclusivity with adherence to tradition and halachah (Jewish law). That doesn’t necessarily mean changing the standards of Conservative Judaism. The dilemma is not unique to Conservative Judaism; the Reform movement has grappled with the same issues. But Reform synagogues are not bound by Jewish law, and the movement recognizes patrilineal descent — two key distinctions from Conservative Judaism. On the Orthodox side, the line against non-Jewish participation is more clear; many strictly Orthodox synagogues won’t even allow the Jewish partner in an interfaith marriage to lead services. Conservative synagogues navigate the parlous middle. The ways they adapt vary widely. Many offer non-Jews the honor of reciting the English prayer for the government, Israel or peace, to keep them part of the ceremony without violating ritual restrictions. Some allow non-Jewish members’ voting rights, while others exclude them from membership. At Kol Shofar, non-Jews can serve on committees, but not the synagogue board. During lifecycle ceremonies, some shuls offer non-Jews a place of honor, but with limitations. At the Woodbury Jewish Center in New York, a non-Jewish parent may join his or her Jewish spouse when receiving an aliyah to the Torah during their child’s bar or bat mitzvah service, but must take a couple of steps back when the blessings are recited. A non-Jewish grandparent may offer an English blessing composed by the rabbi, but only from his place in the pews, not from the bimah. At Helfand’s congregation, the ritual committee is beginning the process of creating policies around inclusion. Currently non-Jewish spouses may stand next to their Jewish spouses on the bimah while the ark is opened. At b’nai mitzvah ceremonies, they may offer blessings to their child, offer a prayer for peace, make a speech or give other English readings. Where Helfand draws a red line, however, is over “faith-affirming” actions, or rituals meant only for Jews. A Christian cleric friend of his once suggested as an analogy a non-Christian wanting to take communion at Mass. It just isn’t done. Rabbi Susan Leider of Kol Shofar has her own view on where to draw the line. This distinction has played out in real time for one Mill Valley family. Longtime members of Kol Shofar, Ruth and Michael Chavez raised their three daughters as Jews, although Michael remains a devoted Catholic. A native of Daly City, Ruth Chavez is the daughter of an Israeli father. She grew up in the Conservative movement and spent a year attending Tel Aviv University. She always figured she’d marry a nice Jewish guy, but as it turned out, she fell in love with a church-going Mexican American Catholic. Michael frequently attends services at Kol Shofar wearing his own yarmulke. He can easily follow the service reading from a fully transliterated prayerbook. For those events, the proud papa did readings while standing on the bimah, though he did not read from the Torah. 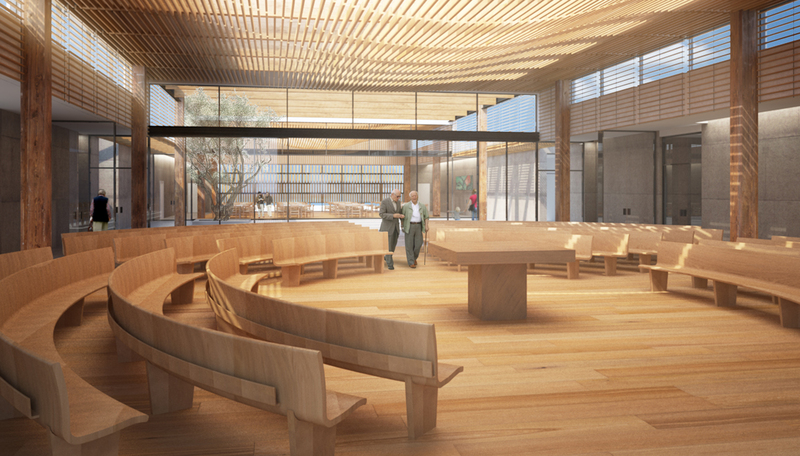 Rabbi David Booth of Congregation Kol Emeth in Palo Alto recently began offering non-Jews a stand-alone role during the prayer service: opening the ark. 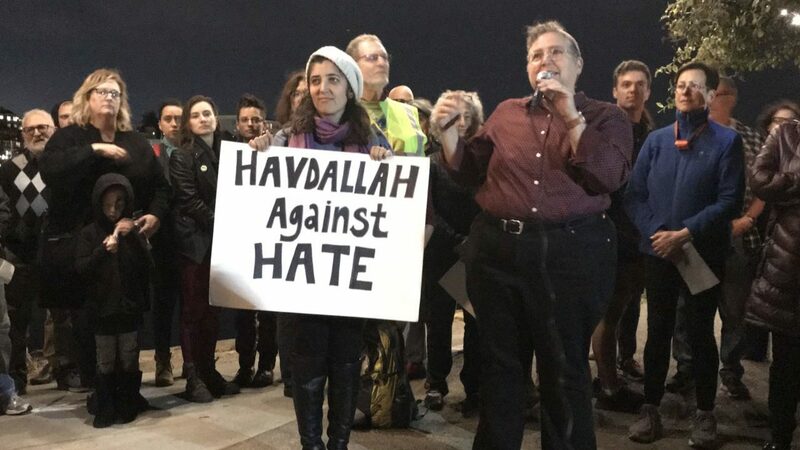 It was a ritual change he proposed last October to the movement’s Committee on Jewish Law and Standards, the body that sets halachic policy for Conservative Judaism. The idea was formally endorsed, though not unanimously. At Kol Emeth, non-Jewish spouses can be voting members. They have a place on the bimah. And non-Jewish children can join the religious school through the fourth grade. After that point, the children must become halachically Jewish through conversion. Booth has seen non-Jewish spouses make great sacrifices to raise their kids as Jews. Elsewhere in the country, Conservative synagogues have sought other ways to spur inclusivity. At Congregation Kneses Tifereth Israel in Port Chester, N.Y., Rabbi Jaymee Alpert offers a public blessing to interfaith couples right before their wedding in an adaptation of the traditional Shabbat aufruf celebration that precedes a Jewish wedding. Alpert also presents the interfaith couple with the same synagogue gift bestowed upon Jewish couples. Some congregations aren’t as flexible. Like many Conservative clergy members in Canada, Rabbi Jarrod Grover of Beth Tikvah Synagogue in Toronto considers intermarriage a breach of Conservative Judaism. At Beth Tikvah, non-Jews are barred from membership. Synagogue mail sent to interfaith homes omits the name of the non-Jewish spouse. 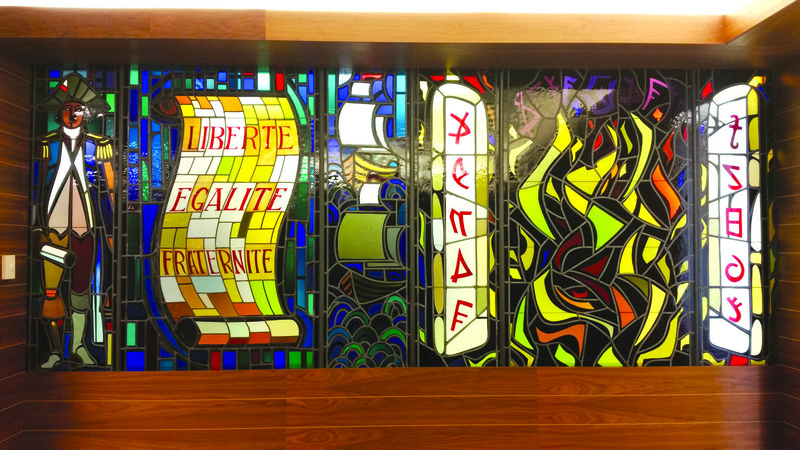 The synagogue does not allow blessings for interfaith unions. “We do not recognize the validity of intermarriages — period. There’s no simcha, there’s no aufruf,” Grover said. He believes the best way to welcome non-Jews and encourage them to raise a Jewish family is to lower the bar for conversion. Locally, efforts to foster inclusivity continue. For example, Kol Shofar has launched an initiative in which “relational ambassadors” from within the congregation reach out to new or prospective members, including interfaith couples. At Helfand’s synagogue, inclusion is the message at Neilah, the closing service on Yom Kippur. At that moment, every person in attendance, Jewish or not, ascends the bimah. That would never have happened in a Conservative synagogue 15 years ago. Dan Pine is senior staff writer at J. Uriel Heilman is managing editor of JTA.